Fiberglass pools are unique...at least when it comes to waterline tile (also called perimeter tile). With a gunite pool waterline tile is required to avoid a waterline staining, and tile is certainly not an option with an inground vinyl liner pool. Only inground fiberglass pools give you the choice of going with a waterline tile or leaving the pool shell exposed above the waterline. So the question before the fiberglass pool consumer is: "Do I want fiberglass pool tile?" Here are some FAQ regarding fiberglass pool tile to assist in making a decision. Q: What type of tile is used on fiberglass pools? A: The same exact tile as gunite pools. Normally ceramic tile but glass pool tile is sometimes used also. Q: What is the method of fiberglass pool tile installation? A: Fiberglass pool tile is installed differently than tile on a gunite pool. Gunite pool tile is adhered to the concrete pool shell with a cement based thin set and then grouted with a cement based grout. Then the plaster or finish coat is applied to the shell. 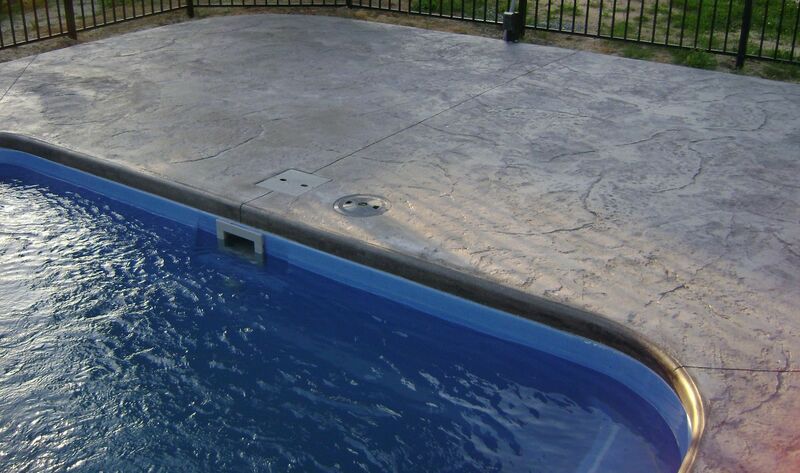 Fiberglass pool tile is adhered with a silicone based adhesive and grouted with a mildew resistant silicone grout and this is applied to the finished pool shell. This is done for several reasons. First, silicone provides a superior bond to both the fiberglass pool shell and the tile. Second, the tile needs to have the ability to flex and bend with the pool during shipping, installation, and as the pool makes subtle expansions and contractions after installation. Q: What are some common pool tile designs used on fiberglass pools? A: Two of the most popular tile designs used on our fiberglass pools are offered by National Pool Tile Group. They are the 6"x6" Aztec series and the 2"x6" Neptune series. Q: Can waterline tile be added later to a fiberglass pool? A: It's possible but not practical. The short answer is "no." Q: How much does fiberglass pool waterline tile cost? A: The average cost is $1,800–$2,500. Q: How long will waterline tile last on a fiberglass pool? A: A minimum of 8–12 years if it is installed correctly and you keep your water balanced. Q: What other types of tile are offered on fiberglass pools? A: Most fiberglass pool manufacturers offer mosaic tile as an option. Examples are dolphins, sea turtles, palm trees, etc. which can be placed anywhere on the pool floor or on seats or steps. This tile is inlayed into the pool shell so it is actually flush with the pool surface. 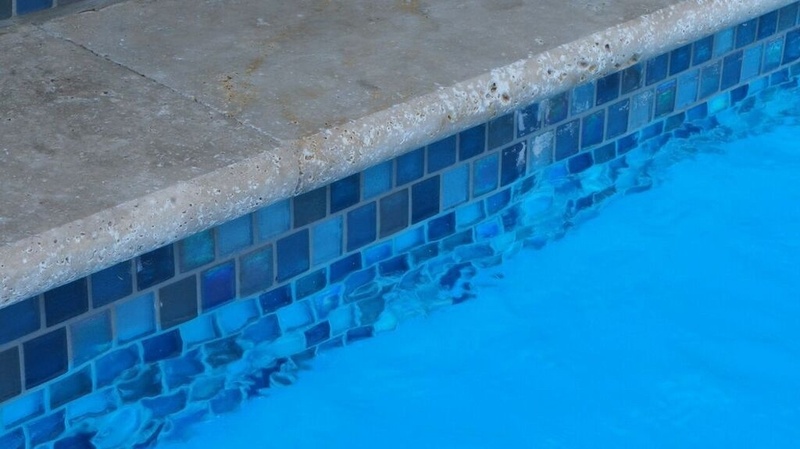 Another common type of tile used on fiberglass pools is a strip of 1"x1" tile placed along the edge of steps and seats so they can be clearly identified. 2"x2" diamonds are also placed in the center of steps and seats for decoration. 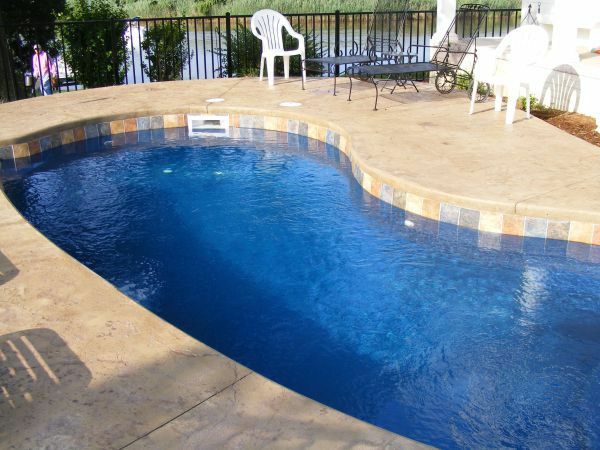 Q: What does a fiberglass pool look like with and without perimeter tile?